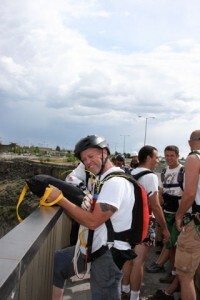 This was a Jump I did last spring at the Perrine Bridge in Twin Falls Idaho. I thought about this for an entire year. I guess you have to be somewhat obsessive because of the risk involved. I didn’t mention it to anybody, just went over it and over it in my head. I laid out all the equipment on the grass in the park by the bridge and showed to my buddy abbie. I explained the jump and ask him if he wanted to do it with me. He said “%&*# no”. My other buddy Jamie quickly volunteered. The jump went off without a hitch, almost exactly like I saw it in my mind. I cut away low but at an acceptable hieght. Jamie told me later I growled “get off” right after the first canopy opened which I don’t remember. I do remember right after he bailed I saw a puff of wind ripple the water and for about a quarter second I knew I was high enough to cut away the first canopy. We both made the shore. Probably not the sanest thing I’ve ever done and it definately attracted more of a crowd than I like while base jumping but good fun in a push the limits sort of way. The Perrine Bridge is located in Twin Falls ID and is the only year round legal BASE Jump in the United States. This was on Memorial day weekend which usually attracts about 100 BASE Jumpers from around the world. You are currently reading "Perrine Bridge Mr Bill Dbag Cutaway"